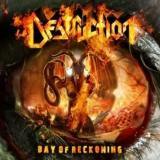 Yikes, time for a new Destruction album already? It seems like only yesterday that I was rocking out to D.E.V.O.L.U.T.I.O.N., their rather good statement of intent from 2008, and Day Of Reckoning contains exactly the number of surprises that fans of post-millennial Destruction are expecting – none! Groovy, well-written, modern thrash metal with a clear line to their musical heritage that will be obvious to any fan of the band’s earlier material is what I was expecting, and Day Of Reckoning more than delivers on each front. I’m always pleasantly surprised by how musically proficient these German reprobates are, the beginning of tracks like Hate Is My Fuel technical and precise, yet this is far from the po-faced futuristic sheen that we’re used to from other tech-thrash bands. Destruction are all about the joy of life, the sheer excitement of the riff, the sudden flash of melody, the sneering vocal line that gets stuck in your head for weeks on end – they’ve always been my favourite of the German big three for sheer entertainment factor alone. Describing Day Of Reckoning in detail is a pretty bad way of reviewing it, so don’t expect copious facts and figures about how this riff turns into a breakdown or that solo was performed on what guitar, and certainly don’t expect a track-by-track breakdown. Reviewing albums in that way always seemed to do more to expose the flaws of both the music and the writer, I always felt, especially when it comes to a genre like thrash metal. Of course, it is true that looked at in a certain way Day Of Reckoning can get a little samey, does take absolutely no musical risks and will not appeal at all to those who rejected D.E.V.O.L.U.T.I.O.N. Yet when absorbed without prejudice, when given a chance to wrap its big muscular riffs around your ears and force your head to bang, it absolutely deserves every bit of praise that it gets. Opener The Price alone is a fantastically chaotic storm of rampaging guitarwork that shows just what a fun ride you’re in for, new drummer Vaaver easily proving he deserves a place on the drumstool behind Schmier and Sifringer. And it doesn’t let up from there, the tracks barely slowing as they rattle into your brain. Armageddonizer’s whiplash tautness, Devil’s Advocate a true metal anthem, Sorcerer Of Black Magic’s stomping silliness – it’s hard to define which tracks are highlights, as the quality bar is set so high throughout. OK, so the title track is a little harder to remember than most of the other tracks, but it fits right into the album’s flow and will cause no disappointment. And that’s a good way of summing Day Of Reckoning up as a whole, really. The thrash wheel needs no reinvention, Destruction say, and they’ve carved a particularly fine example that will get you exactly where you want to go. Expecting anything other than a fun ride will leave you disappointed – why ask more from something than that for which it was made?